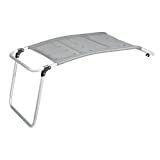 Rest and relax with the Campart Travel CH0609 folding footrest! This elegant and useful padded footrest is a must-have accessory for use with chairs for backyards, terraces, gardens, camping sites, etc. Comes with 2 hooks of approx. 2 cm in diameter to attach it to the lower bar of chairs. Suitable for chairs with a lower bar of approx. 2 cm in diameter. Aluminium structure. Fabric: textilene. Stuffing: foam rubber. Approx. dimensions: 52 x 48 x 96 cm (approx. dimensions when folded: 52 x 11.5 x 96 cm). Perfect for use with the Campart Travel CH0608 folding chair.